CHAIN FREE: This outstanding 3 Bedroom family home offers a wealth of charm and character with beams, brick fireplaces with woodburners, and enjoys views over open countryside. The spacious accommodation has been tastefully updated and boasts a large Inner/Hall/Study, impressive newly fitted high quality Kitchen/Breakfast room with walk-in Pantry, a Utility, Dining Room, Large Lounge and both a Bathroom and separate Shower Room to the ground floor and 3 Bedrooms and a good size Washroom to the first floor which could be converted into a 4th Bedroom if required. There is a Garage, off road parking for 4+ vehicles, a wrap around garden, and oil fired radiator central heating. The property is being sold with the benefit of vacant possession and No Onward Chain and the agents would strongly recommend an internal inspection of fully appreciate the quality of accommodation on offer. 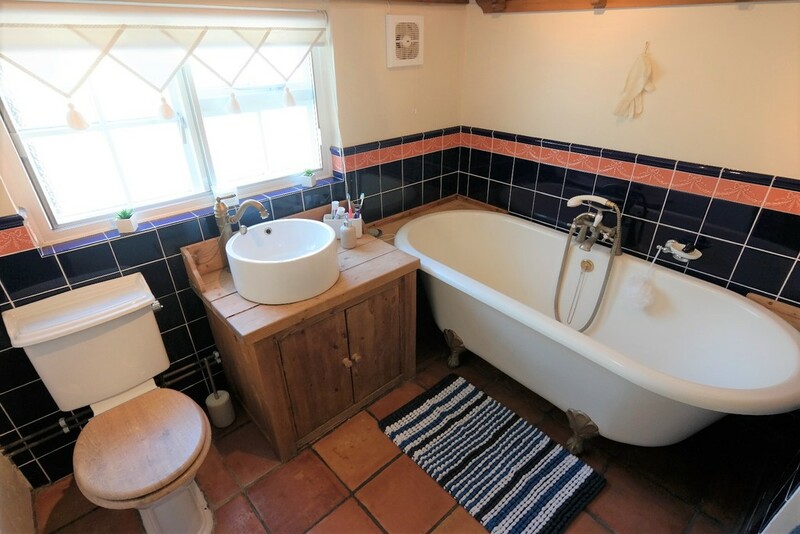 BATHROOM With wooden window to rear aspect, freestanding roll top bath with shower attachment, wash basin, low level WC, half tiled walls, extractor fan, radiator, tiled floor. SHOWER ROOM With secondary glazed wooden window to side aspect, shower cubicle with rainfall showerhead, extractor fan, radiator, electric heater, tiled floor. PANTRY 4′ 5″ x 6′ 4″ (1.35m x 1.93m) With low level units with laminate worksurface, tiled splashback, 3 wooden shelves, tiled floor. UTILITY ROOM 7′ 11″ x 6′ 5″ (2.41m x 1.96m) With plumbing for washing machine, space for fridge freezer, half tiled walls, tiled floor, stable door to garden. 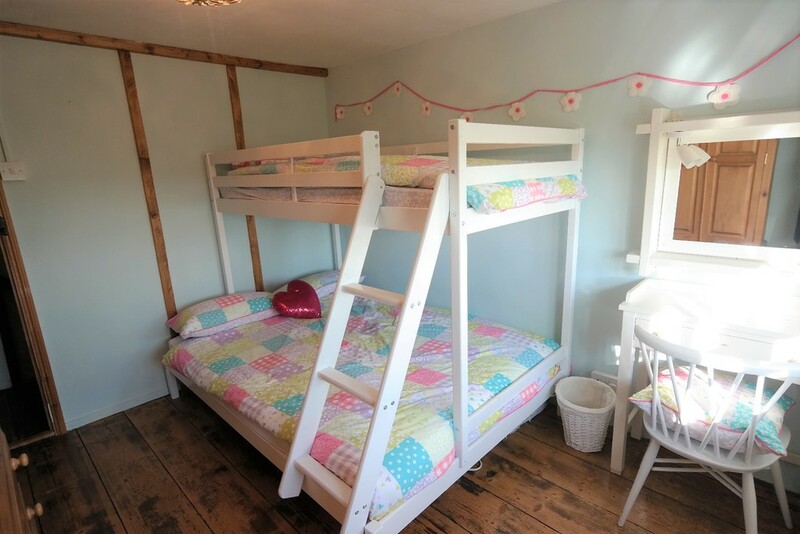 BEDROOM 1 14′ 1″ x 10′ 6″ (4.29m x 3.2m) With sealed unit double glazed wooden window to front aspect with views over the fields beyond, exposed beam to dressing table area, radiator, access to loft space, origianl oak floor. BEDROOM 2 10′ 6″ x 9′ 3″ (3.2m x 2.82m) With sealed unit double glazed wooden window to front aspect, exposed beams, radiator, original oak floor. BEDROOM 3 13′ x 7′ 3″ (3.96m x 2.21m) With sealed unit double glazed wooden window to side aspect, radiator, built in wardrobe, access to 2nd loft, original oak floor. WASHROOM 9′ 6″ x 7′ 4″ (2.9m x 2.24m) (Could be converted to a 4th Bedroom if Required) With sealed unit double glazed wooden window to side aspect, washbasin, low level WC, radiator, original oak floor. OUTSIDE The property is well set back from the road having 2 gates which lead to a gravel drive providing off road parking for 4+ vehicles and leading to the single Garage with power and light connected. There is also a garden shed, flower and shrub borders, and oil tank. The rear garden can be accessed from either side of the property where there is a gravel area with log store and housing for calor gas bottles. The rear garden itself incorporates a large patio, good size lawn, garden shed, and greenhouse. AGENTS NOTE: There is an allotment adjacent to the property which is currently rented by the vendors and does not form part of the property.